By Amrita : Vikas Khanna, who has been associated with MasterChef India since last 3 season has become the most popular entity on the show. Vikas is not just known for his cooking skills but also for his charming smile and his humbleness. No wonder that women go ga-ga over him and don’t even shy away from displaying their love for Chef Vikas. During one such phase of auditions of Season 4 of MasterChef, Chef Vikas got a wedding proposal from a fan. 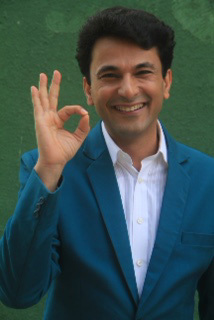 Vikas Khanna has judged previous seasons of MasterChef so his popularity is sky high among Indian audience so it wasn’t shocking to see women going head over heels for him during the audition phase. But what was out of the box this time was a women walking up to Vikas and proposing him. Vikas was so overwhelmed with the love coming his way that he wouldn’t stop blushing and went down on his knees to show gratitude. Chef Vikas confirms saying, “I love the audition phase the most. It is so overwhelming to meet and greet various people who come to meet us from far and who share a common love for cooking just like we do. I have nothing but love and gratitude to give back to these people who have supported me again and again and shown their love. It is these people who pull me back to do Master Chef so here I am, back again as I continue my association with the show and thus with the people”. Vikas has been a judge of MasterChef during Season 2 and 3 and he is back with Season 4 with more love and more recipes to share with people of India.